Have a blue post office mailbox in your town? Then you may be in for a holiday treat! 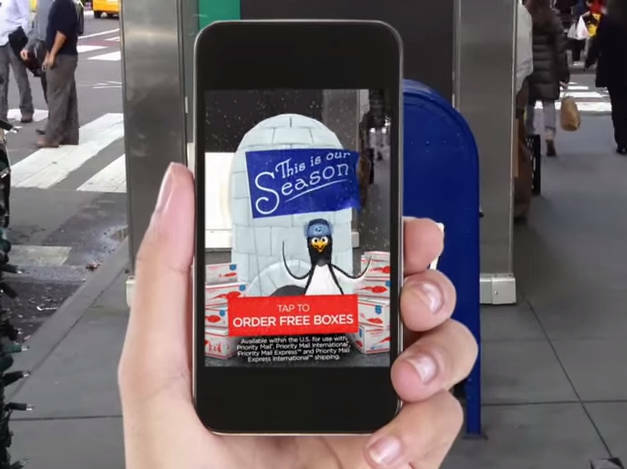 The USPS is launching a new app that, when pointed at one of their famous blue outdoor mailboxes, will show an alternate-reality scene, where characters and illustrations will appear on top of the real-life street scene in front of you. All you need to do is download the "USPS AR" app, available on Android and iPhone devices, then find your local blue mailbox and point your camera at it. A scene will appear, overlaid on the live view of the mailbox! In a press release, the USPS said the scenes will change throughout the holiday season, and will ultimately be advertising seasonal services from USPS, such as discounts on supplies and reminders on holiday shipping cutoff dates. Have you tried out the app? Leave a note in the comments! The Hess Toy Truck for Christmas 2015: A Silver Surprise! A Life-Size Hess Toy Truck!